Daydreaming. Not focused. Easily distracted. Short attention span. These are some of the things I've realised about my soon to be 6-year-old at times when she's given a task. She would do a dozen other things other than the one that I've specifically asked her to do and many a time, I end up nagging at her for not being focused or for not having enough self-discipline. Even if I feel that it can be quite a common problem among kids of this age, it's not a surprise that sometimes I ask myself "How can I help my child to learn to focus better?" The first time I heard about EEG Biofeedback (also known as Neurofeedback), you can say that I was hesitant, or even a little skeptical, about it. Firstly, I must tell you what it means because I had absolutely no idea initially. Electroencephalogram (EEG) is the recording of the brain's spontaneous electrical activity over a period of time. 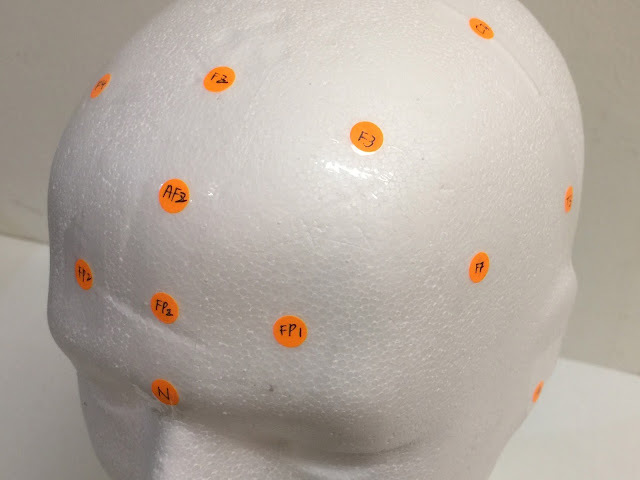 EEG Biofeedback uses real-time display of brain activity to train the brain to learn through self-regulation, which helps it to learn to function more efficiently. EEG Biofeedback most effectively helps children (aged 5-12) to firstly, train their brain to focus (depending on which region of the brain one wishes to work on, in this case it's the focus/attention region) when on a task and secondly, learn to relax when it is time for sleep in order to get quality rest - all without the use of medication. These result in the conditioning of the brain to be task-orientated, highly focused and more efficient in maximising the potential of the brain's performance. In order to find out more about this program, I let Angel attend a brain profiling session which lasted for approximately an hour so we could experience how EEG Biofeedback actually works. Firstly, the therapist gave us a general introduction of how our brain works and explained to us the differences between the left and right brain. To help Angel ease into the new environment, he also let her watched a short cartoon clip while he briefed me on the sequence of events to come. Electrodes are strategically placed on the earlobes or scalp to measure the brain's electrical flow, also known as the brain waves. The therapist will use a skin prep gel to gently cleanse the areas so as to get rid of any dead skin cells. Next, he will place the electrodes, or sensors, in place with the help of a conductive gel which is commonly used in hospitals. This whitish gel can be easily wiped off with a wet wipe at the end of the session. While this might all sound quite alarming, it actually did not hurt in the least and Angel was not affected by the presence of the electrodes. In EEG Biofeedback, four types of waves are monitored - Delta, Theta, Beta and High Beta. When the child is engaged in an activity, the waves are converted into visual signals onto the screen which will then be measured in real-time. I personally found it very interesting to see how my girl's different types of waves change as we switched activities or as time went by. In the first place, I never did know that your level of focus or your state of 'dreaminess' could be measured and conditioned. Every session lasts for one hour and is divided into two parts - Active Training and Sleep Training. In Active Training, the child will get to go through different types of activities such as playing games, watching video or reading. Sounds easy and normal? Well, not at all. In every activity, the child has to learn to focus so that the activity can proceed. For instance, Angel played a game where she had to control a chick to peck at the rice in a field, the moment she got distracted, the chick might refuse to peck at all. Based on the areas that need to be improved on, for instance in this case to increase Beta and Hi-Beta while decreasing Theta, the therapist will vary the thresholds of these brain waves which will change the level of game difficulty accordingly. In watching the video, once the child loses too much focus, the video will either pause or go opaque, depending on the setting. So, in a sense, if the child doesn't want to watch a clip that keeps breaking off, he/she will have to put away the distractions so that the video can play continuously. In the reading session, which not surprisingly was the one that caught Angel's interest most, you get to read off lines of a story from the screen and similarly, the screen will go blank when the child is not focusing hard enough. At the end of the Active Training session, a chart will be plotted and presented to the parent so that you can see clearly how your child's brain waves change during the different activities. The therapist will also explain to you on the significant of these results and how they can be act as benchmarks for specific areas of improvement. Moving on to the Sleep Training, I initially thought that it would be near impossible to get my girl to sleep, or even rest, in a strange environment. So I wasn't that surprised when she said she didn't want to do it. After a bit of persuasion, she eventually said she would try. For this, besides the electrodes on her earlobes, she also had one electrode on each of her temple area. Lights would be dimmed and music would start to play, how soothing and nice it would be to sleep in that armchair, right? I would love to! Anyway, we monitored her for approximately 15 minutes. I was there beside her and to my surprise, she actually fell asleep for a good two or three minutes in the middle. Once again, at the end of the session, the brain waves were plotted onto a graph so that we could have a clear illustration of what happened during the sleep. The therapist said that her example was a perfect one where the mean Delta level went up and Beta and Hi-Beta levels dropped. However, we did note that she tended to squirm and move about, so I believe she has plenty of room to improve in learning to relax and achieve quality rest. This is especially since she always tells me that she has a lot of things running through her mind during bedtime and even gets bad dreams too! To serve as a record, you will also receive a printout of the charts (for both Active and Sleeping Training) at the end of a session. This will help parents to keep track of their child's progress in the future and determine whether they have really benefited from the EEG Biofeedback program. I do think that this has been an eye opener for me and even though it might be hard for us to commit to more sessions in future (a total of 20 sessions, each tailored to your child's individual needs, is recommended so that significant improvements can be observed) due to long distance and travelling time, this brain profiling session has provided an insight into my child's brain development and reminded me that a lack of focus or short attention span might be due to a combination of factors. In any case, it's not hard to conclude that nagging is not the best solution so hopefully, we can come up with better ways to help her tackle these issues from now on. 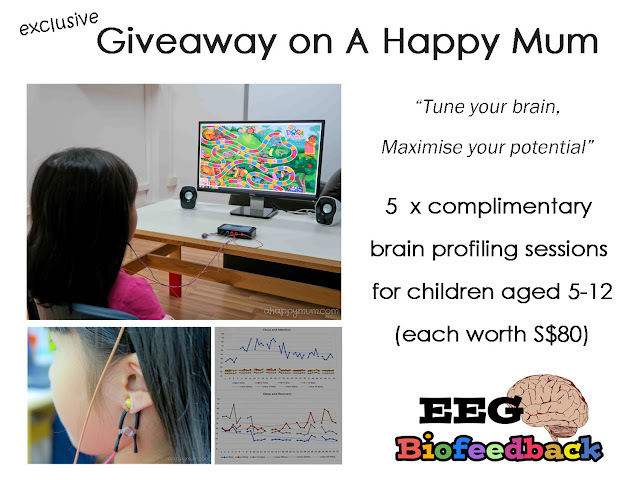 For those of you who are interested in EEG Biofeedback and would like to find out more, or if you are keen to let your child go for a trial session before you decide if it's beneficial for him/her, GOOD NEWS! In conjunction with the official opening of EEG Biofeedback, A Happy Mum is now exclusively giving away complimentary 1-hour brain profiling sessions to FIVE readers! Special for A Happy Mum readers! During the official opening period, simply quote ahappymum30 when you make an appointment and you will be entitled to a special rate of S$30 for a brain profiling session. To take part in the giveaway, leave a comment in this post with your name, email address and tell me what interests you about EEG Biofeedback. Indicate in the Rafflecopter widget that you have commented and to increase your chances of winning, you can choose to carry out the rest of the options. 1) This giveaway is open to all readers residing in Singapore only. 2) EEG Biofeedback is suited for children aged 5-12, participate only if you have a child within this age range and ensure you and your child can show up for a 1-hour brain profiling session. 3) Winners will be able to choose their preferred date/time during the official opening period (11-16 Aug). This will be based on availability and a first-come-first-serve basis. 4) All winners will be randomly chosen and notified by email. They will have 48 hours to respond or a new winner will be picked. 5) This giveaway will end at 2359hrs on 31 July and results will be announced here and on A Happy Mum's Facebook page the following day. Disclosure: We received a complimentary brain profiling session for Angel in writing this review. All opinions are ours. My boy have the same issues as your daughter! I really hope to find a way to tackle them. It would be awesome if I can bring him for some sessions to try it out! My boy is also quite a daydreamer. Hope to assess him with this profiling system, and find ways to help him since he is entering P1 next year. Like you, I am fascinated that our level of focus can be measured and conditioned, so I would like my child to try. If it works, then I don't have to nag at home so much! my 7 year old has a hard time to focus. i hope to win so to know if she just has a short focus span or lack of interest in topic. without knowing which is the factor affecting her. i don't even know how to help her learn effectively beside scolding and canning at times. My soon to be 6 yr old serms to be stressed and anxiety level seemed to increase too. I hope with this profiling, i can help her in a way that benefits her. Also, she's been daydreaming alot! Hope that with this profiling, I will be able to help my girl! I am hoping I get this!! !